Strength training is an important component of training for cross-country skiers. Some of the benefits include improved technique, more power for short climbs, better core strength, improved balance and agility, increased speed, and injury prevention. And since the bottom line is skiing fast, we can’t ignore that several studies have linked various forms of strength training to improved race performances. XC Ottawa athletes typically use a variety of methods to improve strength, including free weights, cable pulleys,body weight exercises, plyometrics, and specific strength on roller skis (e.g., double poling or legs only sessions). A more novel technique that attracts curious stares and brings up many questions is tire dragging. So, read on to find out why we drag tires uphill! Dragging a tire can help develop strength and power in your legs, hips, and core that is specific to classic uphill technique. The tire also helps you get your body in a good “forward lean” position (hips forward), which is important for good cross country ski technique. This “dragging” method is certainly not novel to cross-country ski training. Sprinters, football players, power lifters, and other athletes use resistance dragging to improve acceleration and power (but they typically drag sleds). 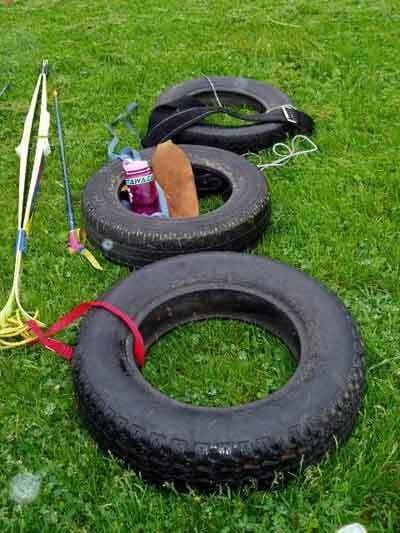 But even ultra-endurance athletes use this type of training: last spring, I spotted ultra-distance adventure runner Ray Zahab dragging a tire up in Old Chelsea. When I asked him about it, Ray said that he pulls a tire during a peaking period for his races. Before major expeditions, he drags a tire twice per week, with one session of hill repeats for about 1 hour, and a second of continuous resistance training that includes dragging the tire on rolling terrain for 2 hours. So You Want to Try Tire Training? 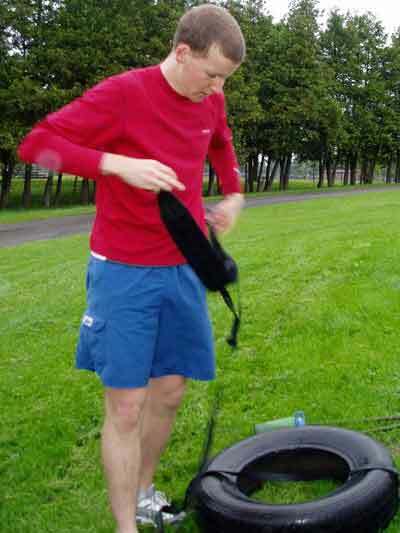 Run a nylon strap or a strong rope through the tire with the other end attached to a weight belt. What size tire should I use? That depends on the purpose of your workout, your experience, current strength, and size. I’m on the small size (barely 5’4, 120 lbs), and the tire I use has a tire code that’s P155/80R13 (first # is the width, in my case 155mm wide and last # is diameter, in my case 13 inch diameter). I like this size, since it allows me to maintain good form, but note that I’ve been told at least once that I need a bigger tire! XC Ottawa athletes drag tires weekly, incorporating this into a dryland workout that also includes running, ski striding, and plyometrics. After a good warmup of easy running, and ski striding, we will start tire strength. Recovery is simply walking down the hill. Start easy. Start with a small tire and a short session. Once your muscles have adapted to this, you can try using a bigger tire and/or increase the number of hill repeats. 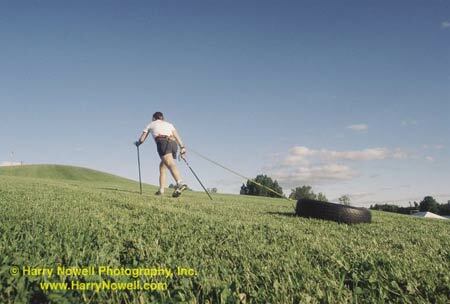 Once XC Ottawa athletes have done this workout for about a month, we sometimes do sprint training pulling the tire, which is covering the 75m uphill as fast as we can. It’s important to maintain good form while striding and bounding. Have a look at these pictures and videos for examples of good ski striding form.